Argos has introduced a new mischievous imp-like character, the Christmas Fool, in a campaign that flags up the retailer's ability to help customers solve last-minute Christmas disasters. 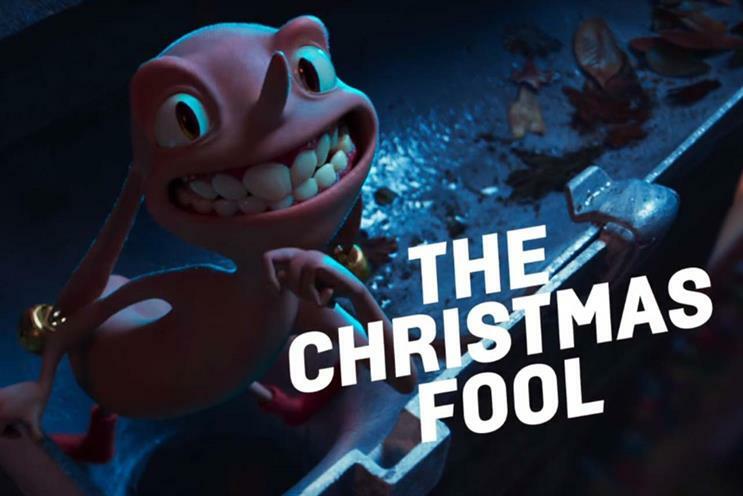 Argos has introduced a mischievous imp-like character, the Christmas Fool, in a campaign that flags up the retailer's ability to help customers solve last-minute festive disasters. A 90-second ad, created by The & Partnership London, features the magical scallywag romping around a neighborhood at night, knocking out Christmas lights, causing the needles to fall off Christmas trees and stealing Scrabble pieces and Sellotape rolls. Fortunately, all of his victims are still able to enjoy their Christmas, thanks to Argos’ swift delivery and collection services. A voiceover calls on consumers to "Foolproof your Christmas" with Argos, also highlighting that collection is available at Sainsbury’s – the first time the link between the two brands has featured in a Christmas campaign. The film closes with the line introduced earlier this year: "With Argos, you’re good to go." In September, Argos launched Voice Shop on Google Assistant, which it said was the first voice-enabled shopping service from a retailer that allowed the user to collect their order from a store. It also expected to double the number of same-day deliveries it makes this festive season compared with last year. The campaign was created by Matt Deacon and Ben Fallows, and directed by Ian Pons Jewell through Friend London. The media agency is PHD, while social and digital components were handled by AllTogetherNow. The TV spot, which airs tonight during Coronation Street on ITV and Gogglebox on Channel 4, will be supported by shorter edits with a product focus, while the Fool character will feature in social, programmatic digital, in-store and print activity. Speaking to Campaign, Argos marketing director Gary Kibble said the ad was designed to support the strategy of communicating Argos’ emotional benefits that the company adopted earlier this year. "We worked with customers to really get an understanding of what Christmas meant to them," he said. "One insight that really stood out is they want Christmas to be this perfect family celebration, but the reality is it never quite is – there’s always something that gets in the way." The creative idea materialised, he said, when they asked thought: "What if that ‘something’ was a character? So we started to think about what kind of a character could personify this notion of something going wrong." While the image of supernatural critters causing carnage at Christmas might bring to mind 1984 horror-comedy classic Gremlins, Kibble said the Fool character was intended to be somewhat lovable and suggested a better comparison might be Dobby, the downbeaten house elf from the Harry Potter series. While the story of the latest spot is unrelated to the three TV ads released earlier this year – the first two featured a family of five piloting a Chinook military helicopter – Kibble said they were all linked through stylistic features, including the use of split screens and an opening title in the same font. These devices "give us an opportunity to be more consistent in other channels", he said: "We very much used the colour palette and diagonal split screen in our press advertising. That creates a level of consistency from broadcast to press." The split screens also enabled richer storytelling, he argued, by allowing more story in a shorter space of time. Asked which products he was expecting to do well this Christmas, Kibble said that drones are now reaching mainstream popularity, thanks the availability of models priced under £100, while there is also interest in items that date from this century but nevertheless feel somewhat retro, such as the Strictly Come Dancing board game and the Harry Potter sorting hat. But he added: "There’s an emerging theme for the product that blindsides lots of retailers out there and, this year, unicorns are definitely that." Unicorn toys Argos is selling this Christmas include a ride-on unicorn and another one that poos rainbow slime. The Christmas ad – always a tricky one for any brand. The perennial problem being, how do you create a Christmas ad without doing a "Christmas ad"? In an era when adland, so often, likes to paint the picture of a perfect Christmas we asked a big question: does a perfect Christmas actually exist? The truth is, something does inevitably go wrong. When we started to look into it, we found the list was endless. Like a true whodunnit, we realised that somewhere, someone, somehow, had to be responsible. Wouldn’t it be good to have someone to blame? And so the Argos Christmas Fool was born. A cheeky, mischievous, pesky creature, who thrives on all the little things that go wrong over Christmas. This gave us our perfect villain – the baddy of the story. Something the goody, our very own Argos, could foil by correcting all his wrongs. Like a good movie at Christmas, we like to see the baddie come to a sticky end. We all know what happens to baddies – they end up in jail. Replace the jail cell with the back of the van, the cell door with the van door, and – hey presto – our fool is banged to rights.